When I was 23, I was a 'desperate housewife' with 2-year-old kid, struggling to finish my study at Uni. Dila and Zata are two lucky girls. In their early twenty, they'd already started their own business, make money and have fun. Well, it's not always fun day at 'the office'. Sometimes Zata juggles her busy Uni schedule (she's in her last semester at Uni) with her task to satisfy customers. Dila spends almost every weekend in the trains, back and forth Jakarta-Jogja. Running business from three different cities can be a bit tricky. Thanks to technologies, we are armed with two wonderful BBs in Jogja and Jakarta and a beautiful mac with high speed internet connection in Sydney. With that, 4 hours time different between Sydney and Jakarta/Jogja is no problem at all. We schedule two photo sessions per month as we launch two collections per month. Sometimes it's behind schedule, due to Dila's busy day at Jakarta. 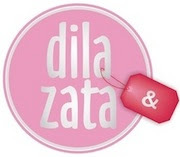 But most of the time, Zata, our wonderful girl, designer and stylist at Dila&Zata Shop can make it. Zata is smart enough to 'recruit' her BFF, Yuyun and also our 'lucky' customers, Nadia and Amha when Dila is not available. Nervous enough, Dila and Zata managed to do their first photo session at the convenience of Dila's (parents) home at Salam. I had already order them to take some Behind The Scene shoots but yeah, forgave that nervousness. The result is amazing. No nervousness or awkward pose whatsoever. They are just fabulous. You can see the photos of first session here. Three other photo sessions held in various location in exotic Jogja: Tamansari (The Water Castle), Vredeburg Fort and Kotagedhe. Formerly Tamansari was a recreation garden or a resting house for the Sultan and Family. Now it's almost like a ruin (even worse after 2006 earthquake). But you can still see the beauty of this retreat complex. Beside as tourist spot, Tamansari is also a favorite spot among (newbie) photographers. Having photo session in here, photographer is spoiled by so many natural background choices, opportunities to do framing with those beautiful arch and tunnels. Here are the girls at Tamansari. Too bad Dila couldn't make it. You can see full photos at Tamansari here. Early this month, we did photo session at Vredeburg Fort. The location suited our theme well for February. We launched "Sweet February" with lots of soft colour like pink and pastel. That day, Dila's boyfriend was there with special task: to handle our gas balloons as props :) Our photographer is Dara, Zata's little sister who is very talented in doing model photography. She could shoot from extraordinary angles and present us with lovely pictures, here. Just two days ago, Zata went duet with her sister (again) to do a photo session for our latest collection: Imported Floral Maxi Dresses. They both head to Kotagedhe, just a quick stroll from their home. Kotagedhe is an ancient city, formerly the capital of Islamic Mataram Kingdom in Java. This old city complex has beautiful narrow lane ways, traditional Javanese house, old cemetery, old mosque etc. Dara did amazing job here. She put a contrast between old house, broken door, exposed brick and the beautiful Zata in our maxis. You can see the full picture of our latest collection here. Next month, Dila and Zata will fly to Singapore to do some shopping and (of course) their personal photo session. Oh, my, I dream of joining them.